Bridge column, February 27: Do you choose hearts or no-trump? Posted on Mon, Feb 27, 2012 : 5 a.m.
Oscar Wilde defined a pessimist as someone who, when he has the choice of two evils, chooses both. In today's deal, North has a choice: hearts or no-trump. With an eight-card major-suit fit, you usually head toward that game. But with a solid six-card minor, you normally make a beeline for three no-trump. What happens when these opposing forces collide? You need to guess well -- although in this deal, there is no winning choice against best defense. First, though, one secondary point about the auction. Is North's two-club advance forcing, or invitational but nonforcing, or strongly suggesting a place to play? I like forcing, but the majority prefer encouraging. In this instance, the hand fits into both categories, so everyone is happy. 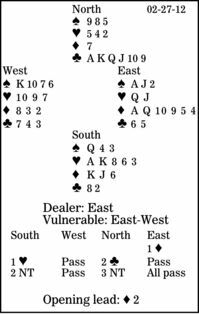 When South rebids two no-trump, North might continue with three hearts, but three no-trump is sensible with six instant winners. Against either contract, West will surely lead the diamond two, low from a tripleton since he did not support his partner's suit. To East, after taking that trick and seeing South play his six, it should be obvious to shift to spades. And here he must just be careful to lead the jack or ace. If he chooses the two and declarer plays his queen, the suit blocks. However, South might be able to deflect East by dropping his diamond jack under the ace. When one's contract seems to have no chance against best defense, playing an honor out of the blue might lead to a pleasurable outcome.